Central to the success of the Answer ALS program is participant recruitment. 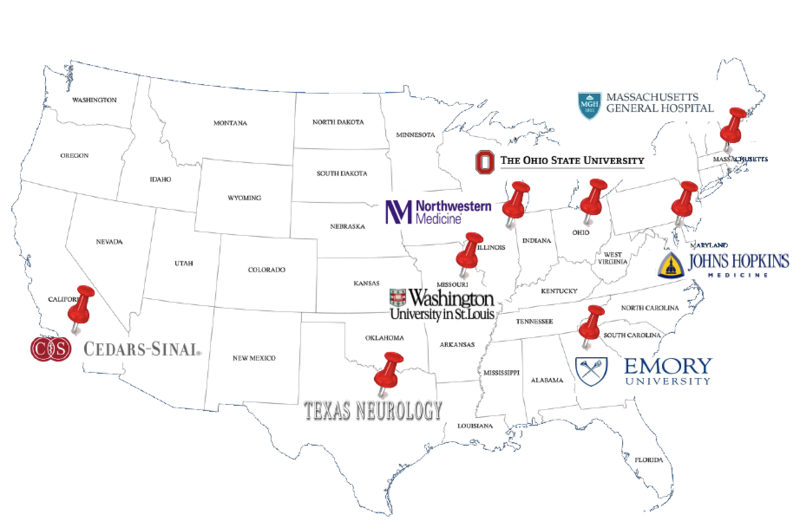 At the onset of the program, Answer ALS selected six Northeast ALS Consortium (NEALS) sites to serve as recruitment centers for the research trial. These centers were chosen based on their known potential to aggressively recruit and retain participants. On June 1, 2016, all six sites were active and enrolling patients. On June 28, 2017, just over a year later, our clinical team reached a significant milestone; they enrolled the study’s 500th participant- halfway towards our goal. We hope to maintain that momentum as we strive to enroll the next 500 participants. We are pleased to announce that two new sites will soon join the Answer ALS team – The Les Turner ALS Research and Patient Center at Northwestern Medicine in Chicago, IL, and Texas Neurology in Dallas, Texas. Please check back regularly for updates. We are on target to meet our recruitment goal of 1000 patients by 2019. Current enrolling sites are below.